Having long hair which I have used far too much heat on colour on has resulted in having pretty dry hair. 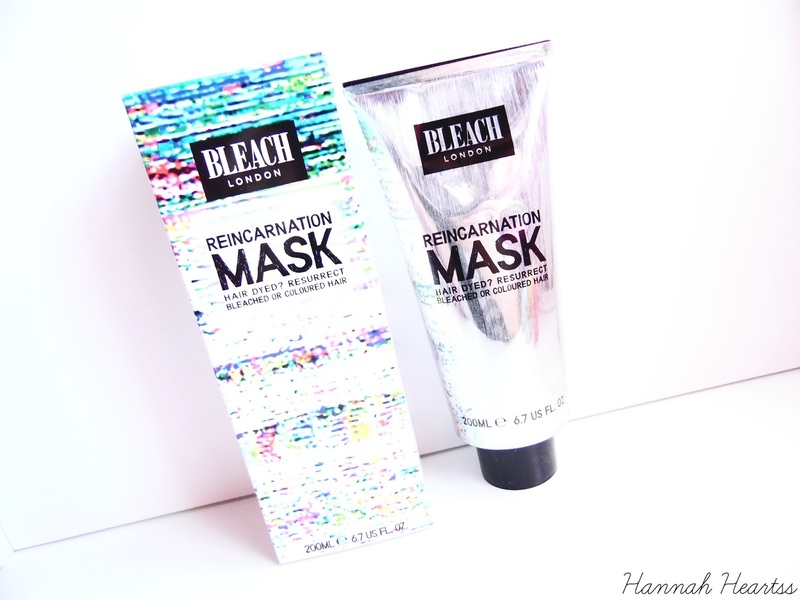 Bleach London is a brand that I always over look when I am browsing Boots because I don't bleach my hair but I had seen a couple of reviews on this Reincarnation Mask and I knew I needed to give it a try and I am so glad I did! This hair mask is aimed towards those that have coloured or bleached hair and aims to hydrate, repair and improve elasticity while being moisturising. I have been dyeing my hair since I was about 13 and my hair is quite damaged because of that, and the heat that I use on a daily basis. It is enriched with sunflower seed extract and also wheat proteins to give shine, strengthen the vibrancy of your colour and help reduce the colour from fading. To apply this mask you have to have pre shampooed hair, aka wet hair slightly towel dried. I applied it all over my hair and you can leave it on for anywhere between 10-20 minutes but leaving it on any longer wouldn't hurt. I like to apply this when I am in the bath so my hair is kept warm but you can always wrap your hair up in a towel. I really like the packaging for starters, it comes in a metal tube which makes it so much easier to get product out specially when you are coming to the end of the product. The mask comes in a pretty good size of 200ml which isn't bad for £6! The mask itself does have a slight natural like scent which I like but isn't over powering nor does it linger too much in my hair. Once I has rinsed the mask out of my hair I had already noticed a massive improvement. My hair was left so much softer which I had really missed because it has been really dry for over a week. Once I shampooed and blow dried my hair I knew why everybody loves this mask so much. My hair still felt incredibly soft and it looked so glossy. My hair is very long and the ends have never had shine until I used this, so impressed! My hair feels like new and I haven't had that feeling in a long time. Even after a couple of normal washes, my hair still left as incredible as it did when I had first used it. I have been using it twice a week to keep the softness and shine to my hair and I cannot recommend it enough if you use colour or bleach on your hair. I can't believe this is only £6, I would pay so much more for what it does to my hair! You can get this Bleach London Reincarnation Hair Mask for £6 at Boots.